We are proud to introduce our newest products to our fine collection of glowing items, Illuminati LED Furniture! Our new Illuminati line of LED Furniture looks awesome during the day, with its milky white, modern exterior, but lights up in exotic colors at night in which you can control. From candle effects, cool white light, or one of 160,000 colors to choose from, you can now have your furniture live in the light YOU see fit. 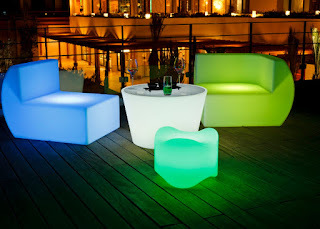 LED Furniture is made from Eco-Friendly materials and is not only a great looking product, but intensely strong. Made from shatterproof Polyethylene, this furniture can be sat in, dropped, or even dunked as it's fully waterproof to boot! Performs great in sunny weather, but engineered to perform for even the coldest of climates, new Illuminati furniture is meant for any weather mother nature can throw at it.